UCL-HEP is one of the largest groups in the SuperNEMO collaboration. It provides the collaboration's co-spokesperson (Prof. David Waters) and former co-spokesperson (Prof. Ruben Saakyan), as well as the deputy data quality coordinator Dr. Michele Cascella and deputy analysis coordinator Dr. Cheryl Patrick, and participates and leads a number of activities described below. Prospective PhD students are expected and encouraged to get involved in any of them. With the SuperNEMO Demonstrator scheduled to take its first data in late 2017, we are busy studying simulation of both ββ and potential background processes in the detector, and preparing software that will be used to analyse our data. For this we use SuperNEMO's own set of custom simulation and reconstruction tools, as well as the ROOT physics analysis framework. Analysis will be ramping up as we prepare to take data, with UCL taking a leadership role. Our event viewer is particularly helpful in understanding the characteristics of our signal and background events. You can see an example ββ event below, with two curved electron tracks leading to calorimeter hits that add to an energy close to the characteristic 3MeV of a 0νββ decay of 82Se. For the purpose of carrying out large scale simulations, SuperNEMO has established itself on the LHC Computing Grid (LCG): supernemo.vo.eu-egee.org is a Virtual Organisation open to all members of the SuperNEMO collaboration in order to access large computing resources. Traces of the products of uranium and thorium radioactive decay chains are found in all materials. SuperNEMO demands that the level of naturally occurring radioactivity be kept to an absolute minimum. Therefore only radioactively clean materials can be used in its construction. Once a material has been selected for use in the construction it has its radioactivity measured by a High Performance Germanium Detector (HPGe) which can measure activities to very low levels. One of the most dangerous natural backgrounds is radon, a naturally occurring radioactive gas that can diffuse out of the detector construction materials into the tracking detector. Even the smallest levels of radon can have a detrimental effect on the experiment's sensitivity. To address this challenge the UCL group designed and built a dedicated setup, the Radon Concentration Line (RnCL). RnCL is a machine that pumps the gas through ultra-pure activated charcoal, trapping the radon atoms. These atoms can then be counted via their alpha-decay process to measure very low levels of radioactivity from radon in the tracker. Radon concentration line for ultra low radon activity measurements in gases. The SuperNEMO tracker is constructed in 4 quarter sections each in the shape of a C, hence known as C-sections. The UCL group assembled the C-sections at MSSL, where they were then tested for radio-purity with the RnCL and commissioned before being transported to the LSM. The UCL group has also designed and built a gas system, which will deliver the required gas mixture directly into the Demonstrator module. With all detector modules now at LSM, the current focus is on commissioning the tracker and the entire Demonstrator and getting ready for our first physics data at the end of 2017. Tracker cell insertion (left) and fully instrumented C-section (right). An optical module from the calorimeter. 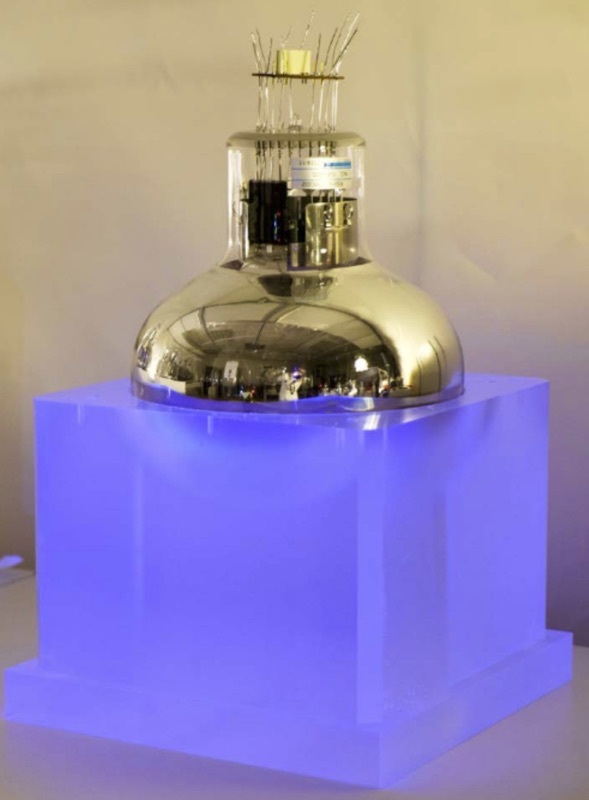 One of the key challenges of the SuperNEMO detector development programme has been to improve the energy resolution of its calorimeter by a factor of 2 compared to NEMO-3. The UCL group provided a major contribution to this R&D programme that resulted in an unprecedented resolution of 3% (σ at 1 MeV) for a calorimeter composed of large volume plastic scintillator blocks coupled to photomultiplier tubes. This technology can go beyond SuperNEMO and is currently being adapted for proton therapy applications. The group has also contributed to the development of the design of a light injection calibration system for SuperNEMO that is aimed at tracking the variation in the gain of photomultiplier tubes and the light output of the scintillator at a level of 1%.